Give your eyes a break so you can focus on the music. The XtraFlex LED Music Stand Light is breathtakingly bright and also happens to be one of our lightest, most compact music lights. Affordably priced and travel-size, it's ideal when you are on the move (and on a budget). With a bright white LED and long battery life, the budget-friendly XtraFlex is an incredible bargain. Clip it to any surface, use it freestanding, or carry it backstage in a pinch. 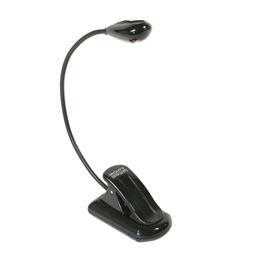 You have full control over the gooseneck to illuminate music sheets, soundboards, and other surfaces. It may even help to shed light on ticket sales.